An earlier post mentioned charitable organization Practical Action's Flood Early Warning Activities in Nepal. Given that the winter holiday season is coming up, maybe you'd consider giving the gift of water-related relief? They even have gifts as cheap as Lollipops for Cows. Anyone interested in how much of a trial-and-error process working in real-world communities can be should read their report "Early Warning Saving Lives", discussing how they set up Flood Early Warning Systems here in Nepal. It gives a good assessment at each stage of the process of what worked and what didn't. 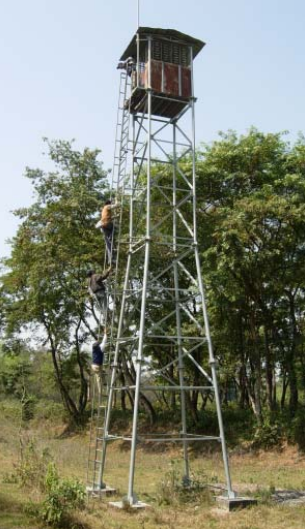 Local people were familiar with the idea of early warning for dangerous wild animals based on tall lookout-towers. They built on this by erecting flood watch towers that included sirens. Flood watch and warning tower in Nepal. As is typical, things don't always work as well as they do in theory. The sirens have an advertised range, say of a few kilometers. However, this isn't the actual range of how far the sound travels when the rain is coming down in buckets... Also, it is hard to hear the sirens when rain is falling noisily on metal roofs, as are common in Nepal. But is the answer a bigger siren, requiring more electricity? If batteries can't give enough electricity, the sirens have to be connected to the power grid at a local house. Also electricity isn't necessarily reliable here, especially during flood disasters. Is it better to have many smaller sirens than fewer bigger ones? A common challenge was that of knowing travel times of the river. Namely, another village 20 km upstream could call and warn that a flood was coming, but how long would it be until it arrived? In some countries there would be historical records of streamflow to base these calculations on. Instead, the community suggested throwing a soccer ball or bottle into the river upstream and see how long it takes to get downstream. There is mention in Practical Action's document how a soccer ball would "spin" as it rolled along the surface of the river and so it would travel slower than the actual flood wave. Writing out the actual physics of how that works seems to me like it would be a good hydrology graduate course test question. Feel free to show your work in the comments section below. My solution would be to use a sealed, half empty bottle so it's partially weighted down. 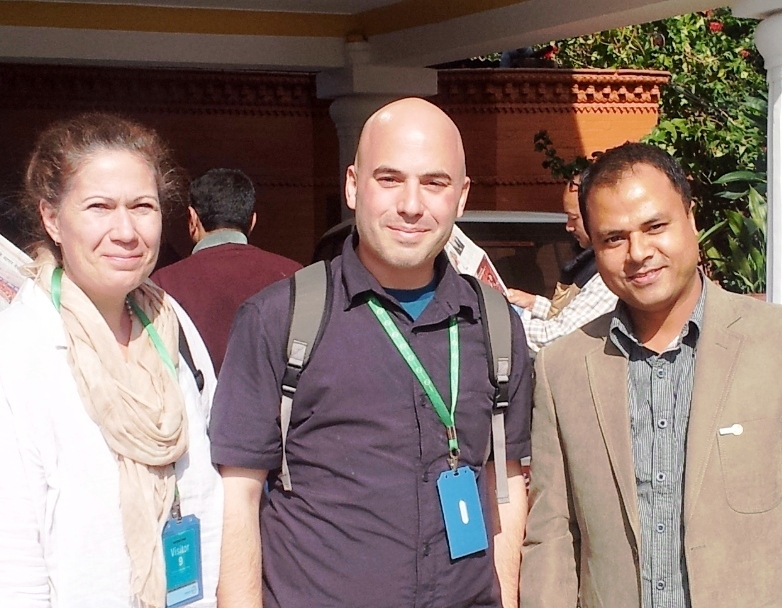 Another thing that impressed me was the cost of data in Nepal. The government pays people that measure rainfall 20 rupees ($0.25 USD) per observation. They typically measure three times a day and the community was trying to raise the funds to increase that to eight measurements per day during the monsoon. In comparison, automated computerized gauges cost about $2000 USD. Basically, it costs the same to install a single automated gauge as it does to pay a human to measure rainfall three times a day for thirty years. Practical Action also has a lot of other useful and readable documents on their webpage related to climate change and disaster reduction in Nepal. How much money are US hydrologists earning? Tom Pagano. Awesome Inc. theme. Theme images by Josh Peterson. Powered by Blogger.